Pioneers in the industry, we offer eto sterilizer for cath lab (c.s.s.d), eto sterilizer for hospital & medical use, eto sterilizer for ophthalmic use, eto - ethylene oxide gas sterilizer for industrial use, eto sterilizer for laparoscopy & endoscopy use and eto sterilizer from India. ETHYLENE OXIDE gas is a sterilizing agent at desired low temperature and moisture with good penetration power under desirable conditions. 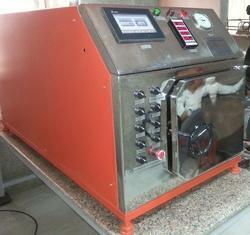 Ethylene Oxide sterilization is the effective method of sterilization. STERI TECHNO FAB is well-known name in manufacturing of ETO Sterilizer for hospitals, surgical disposables industries and food processing industries globally. We provide complete solution for ETO sterilization with ETO STERILIZER, EO gas cartridges, Packaging Reels (Sterilization Reels) Indicator tape for ETO, Indicators. 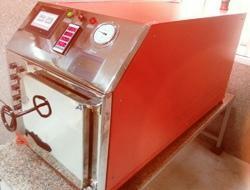 We have some standard sizes in ETO Sterilizer as well as provides customize sizes as per customer requirement. This model is specially designed for cath lab and CSSD use which highly recommendable for heart specialist doctors and hospitals. Chamber is prepared from stainless steel 316 grade material. Machine can operate with triple mode either with 100 % EO Cartridge or with different mixtures of EO with CO2 or with EO cylinder. 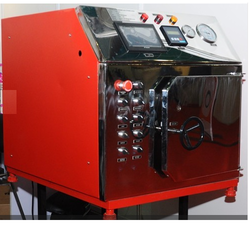 SS Trolley is provided with the machine for easy operation of loading and unloading of material to be sterile. Pre-Requisite sequence phases are defined to run the cycle in automated mode. Post-sterilization phases are defined to remove residual gas from the material (Aeration). Five user defined cycles are available including Cold & Warm cycles. Inter locks at different stages are available to provide safety. It will ensure proper parameters are maintained during the sterilization cycle. 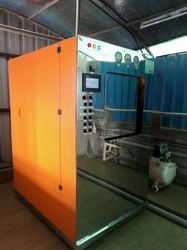 Fully-automatic with touch screen HMI & data recording, PLC based automatic & Semi-automatic models are available. Password protection for unauthorized access. Records of data are available in non editable data sheet as well as graph format. Very low operating cost compare to other available option. Table top and fully box cover models. Power Supply: - 230 V AC (Single phase). Packaging Details: IT COMES WITH STANDARD PACKING AS WELL AS WITH WOODEN BOX PACKING*. Chamber Volume (Litre) Customized Sizes Are Available As Per User Requirement. Warranty 12 Month After Installation. STERI TECHNO FAB is well-known name in manufacturing of ETO Sterilizer for hospitals & medical industries globally. We provide complete solution for ETO sterilization with ETO STERILIZER, EO gas cartridges, Packaging Reels (Sterilization Reels) Indicator tape for ETO, Indicators. We have some standard sizes in ETO Sterilizer as well as provides customize sizes as per customer requirement. * Chamber is manufactured from stainless steel 316 grade material. * Machine can operate with triple mode either with 100 % EO Cartridge or with different mixtures of EO with CO2 or with EO cylinder. 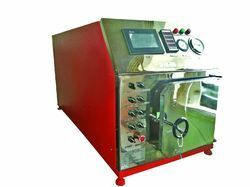 * SS Trolley is provided with the machine for easy operation of loading and unloading of material to be sterile. * Pre-Requisite sequence phases are defined to run the cycle in automated mode. * Post-sterilization phases are defined to remove residual gas from the material (Aeration). * Five user defined cycles are available including Cold & Warm cycles. * Inter locks at different stages are available to provide safety. It will ensure proper parameters are maintained during the sterilization cycle. 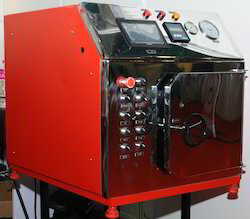 * Fully-automatic with touch screen HMI & data recording, PLC based automatic & Semi-automatic models are available. * Password protection for unauthorized access. * Records of data are available in non editable data sheet as well as graph format. * Very low operating cost compare to other available option. * Table top and fully box cover models. * Almost maintenance free machine. * Power Supply: - 230 V AC (Single phase). * Auto-Man: Manual changeover option in case of Auto system breakdown. Packaging Details: PACKAGING WILL COME WITH WOODEN BOX* OR WITH STANDARD PACKING. This model is specially designed for ophthalmic surgery use which highly recommendable for ophthalmic surgeons, doctor and hospitals. Packaging Details: IT COMES WITH STANDARD PACKING AS WELL AS ALSO COME WITH WOODEN PACKING*. Size CUSTOMIZE SIZES ARE AVAILABLE AS PER CUSTOMER REQUIREMENT. STERI TECHNO FAB is well-known name in manufacturing of ETO Sterilizer for surgical disposables industries and food processing industries globally. We provide complete solution for ETO sterilization with ETO STERILIZER, EO gas cartridges, Packaging Reels (Sterilization Reels) Indicator tape for ETO, Indicators. We have some standard sizes in ETO Sterilizer as well as provides customize sizes as per customer requirement. Packaging Details: IT COMES WITH STANDARD PACKAGING AS WELL AS WITH WOODEN PACKING*. This model is specially designed for laparoscopy, endoscopy and other surgery use which highly recommendable for surgeon doctor and hospitals. Chamber is prepared from stainless steel 316 grade material. Machine can operate with triple mode either with 100 % EO Cartridge or with different mixtures of EO with CO2 or with EO cylinder. Packaging Details: IT COMES WITH STANDARD PACKING AS WELL AS PACKED WITH WOODEN BOX*. This model is specially designed for gynecology, orthopedic and other surgery use which highly recommendable for gynecologist, orthopedic surgeon and other surgeon doctor and hospitals. Packaging Details: IT COMES WITH STANDARD PACKING AS WELL AS COMES WITH WOODEN PACKING*. Looking for ETO Sterilizer ?